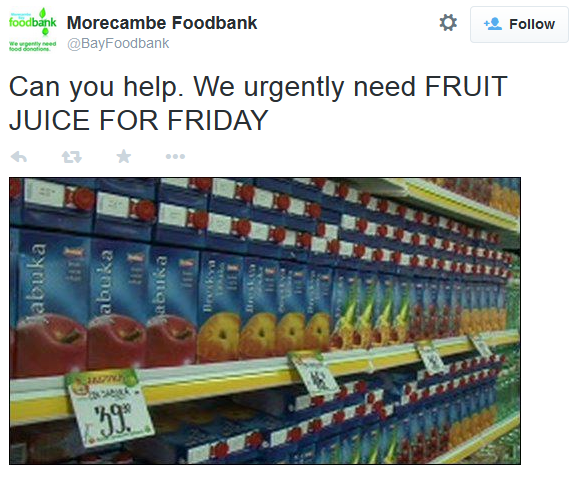 I’ve always felt uneasy about foodbanks. Don’t get me wrong, they’re run by kind and caring people – who care pasionately about some very vulnerable people. However, I watched an academic debate about foodbanks, and realised that I was right to have concerns. I think it should be a basic human right to be able to have some choice about what you eat. I’m not talking about whether to have beluga caviar or foie gras (and I wouldn’t want to eat either). I’m talking about the right to choose my own basic food items. I can’t imagine how I’d feel if my diet consisted of items chosen by others. and I fear this figure is rising. So where’s the fresh and healthy ingredients like fruit and vegetables? I realise why they’re not asking for these items – it’s not very practical for the operation they’re running. So if you’re destitute, our society now thinks you should live on sugary processed goods (to help your health deteriorate)? – because it includes the word “fruit” many people think it’s a healthy choice. As someone who has diabetes I know it makes my blood sugars soar (and crash) almost as fast as pure sugar. That leaves me feeling first tired and then irritable, and once your blood sugars become unstable it’s a job getting them right again. The politicians like foodbanks, as they can pretend the problem is being dealt with – at no cost to them. The supermarkets also love supermarkets, as it’s an opportunity to increase their sales and pretend they have a conscience! You see messages like “Buy an extra tin and leave it on the way out”. Wouldn’t it be better, from a logistics point of view, to ask for cash and buy exactly what was needed (in bulk from a cheaper supplier)? 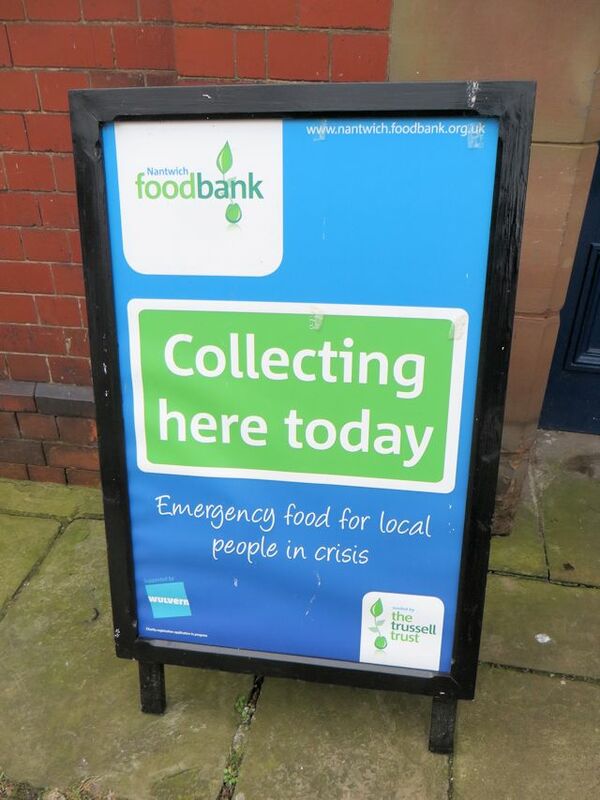 So when politicians come knocking on my door, I’ll be asking them what they intend to do about food poverty – so that foodbanks, like slavery, can hopefully become part of our history. 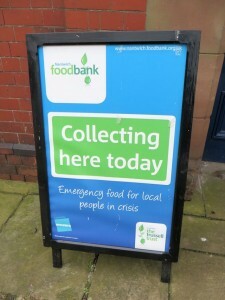 I have mixed feelings about Food Banks myself – I do feel that, as under Thatcher, the voluntary sector is doing Cameron’s dirty work for him by making his ‘Big Society’ idea work to a certain extent and I think you make some telling points about the food that is on offer. I’ll be emailing you a report with statistics on Food Banks in Bristol – all of them run by Christian organisations. I’m very pleased that you included a link to my little book – the paperback will shortly be available for sale from the CAAT website. You might like to have a look at the Equality Trust website (http://www.equalitytrust.org.uk). Many years ago in the 1970s there was a short time when I would have been glad of and grateful for a three day emergency package of this sort. You wouldn’t have had any complaints from me. In fact most the foodstuffs listed would have given me a sense of well being and would have fed me for the short time I needed them. There were no foodbanks in those days so I went without and became quite weakened and ill. Fortunately (and obviously) I’m still here and have suffered no long term ill effects. Don’t knock foodbanks, these foods are meant to last and are perfect for their purpose. I bet those in real need will be just as appreciative as I would have been.